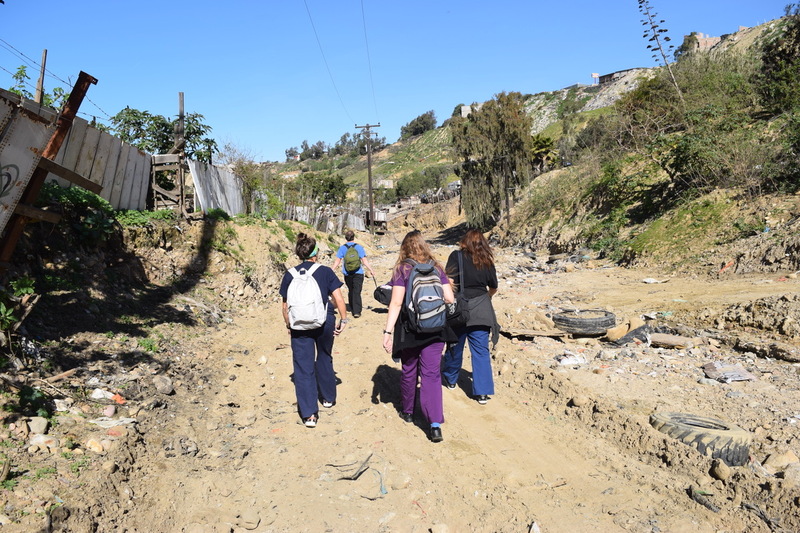 TIJUANA — Five medical volunteers carry duffel bags full of medication and equipment down a dried-up, barely navigable river-bed on the outer fringes of Tijuana, Mexico, headed to a church where about 180 migrants have found shelter. Birds chirp beyond the high alcoves of the large church facility, as migrants shake open their donated tents, prepare for work in the city, or line up at the volunteers’ makeshift clinic in hopes of getting medical service for a wide range of aches and pains. The clinic is just one of six or so satellite clinics set up by San Diego Border Dreamers in shelters across the border city every Saturday. Volunteers and collaborators show up in the dozens every week, aiming to provide sustainable care for a growing number of indigent migrants. With an estimated 5,000 Central American migrants having arrived in Tijuana since November, health problems among the migrant population have become rampant — from the immediate to the chronic, from scabies to asthma, from lice to surface wounds. According to volunteer and former combat medic Wendy Barranco, the volunteers primarily deal with “public health concerns” — health problems borne out of substandard living conditions in many of the city’s either improvised or outdoor shelters, particularly due to the cold. 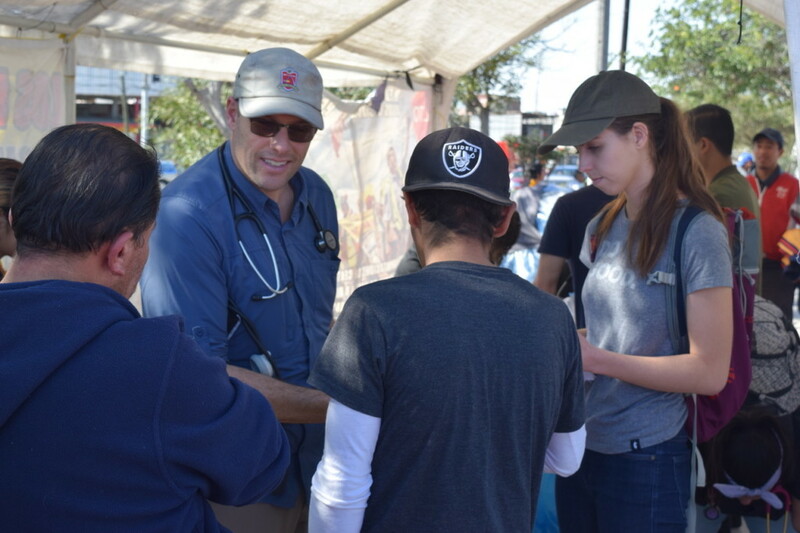 Volunteers will defer patients to the general hospital or other local specialized professionals for acute trauma, but volunteers can triage and treat a number of issues such as bacterial infections, or minor foot injuries from the caravan’s long trek. The organization is trying to maintain a steady flow of volunteers in anticipation of increasing needs — a new caravan with estimates of at least 1,000 migrants is making its way through Mexico; and after a few false starts, the United States is enforcing a new policy that will keep asylum-seekers in Mexico as they await their day in court. “The situation changes every day,” said volunteer Julie Sierra, a doctor specializing in internal medicine who has been helping at the clinics since November. But as of late, providing ongoing care has proved to be more of a challenge. “Now that the novelty of the crisis has dissipated we have found that it is harder to recruit volunteers for the weekend clinic,” he said. The group has one main location — which coordinators asked not to be named for safety and security reasons — where services are now provided daily. On Saturdays, they send volunteers to set up clinics in different corners of the city. Their efforts first began in April, when a much smaller caravan of hundreds arrived in Tijuana, according to Canete. They resumed their services in November. “The major goal is to build the infrastructure and system to mobilize medics and resources when a crisis occurs,” Canete said. 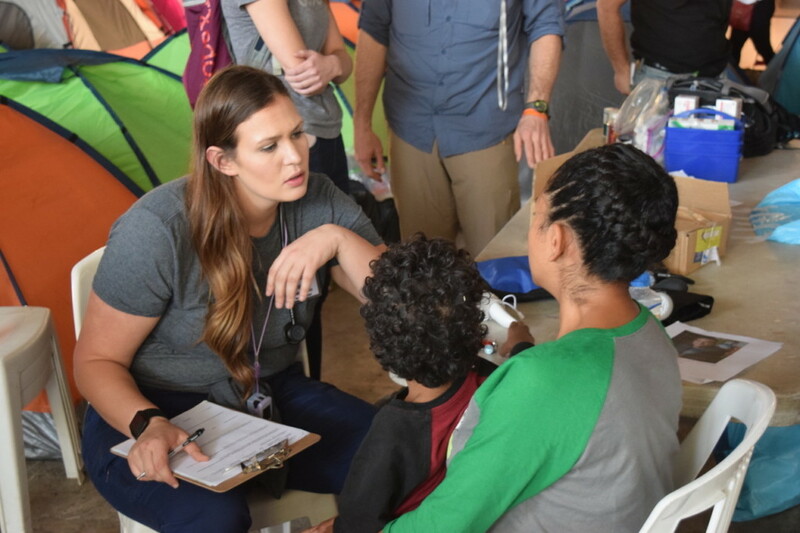 Volunteers Taggart Long and Lauren Sitts work with patients at a shelter near the border wall. Long is a firefighter from St. Louis, Missouri working with Frontline Wellness United, and Lauren Sitt is an aspiring nurse working for a biotech company in San Diego. The group receives funding from its GoFundMe page and individual donations, and spends anywhere from $300 to $700 a week on medication and supplies. They work with local officials from the Secretary of Health and the National Institute of Migration to coordinate their efforts. Volunteers come from all walks of the medical sphere — emergency medical technicians, firefighters, nurses. Most of the volunteers take patient histories and record vitals, while trained doctors help treat wounds, answer questions and dole out proper medications. Long, who is a volunteer with Frontline Wellness United working alongside Border Dreamers, spent much of his day working at an outdoor camp with grim living conditions, the United States border casting a shadow over the encampment less than 50 feet away. Migrants filter out of rows of tents — what has become a familiar sight in Tijuana — to receive treatment. Patients at this shelter and others are not just migrants from the Central American caravan. Some have traveled from the world over to reach the border city. Many are Haitian immigrants who fled Haiti after the 2010 earthquake, as well as Mexicans from different parts of country, and those who have been deported from the United States. For obstetrics and gynecology resident Luz Corona Gomez, working with the migrants strikes close to home. Gomez’s own parents migrated to the United States in order to start a better life for their family.